You may know by now that magnesium is involved in over 300 enzymatic processes plus it is present in every single cell of the body, and is important for your brain to your heart rhythm, lung function, bone density and much more including regulating blood glucose. And by the way it is useless taking a blood test for magnesium – only 1% of the body’s magnesium is present in the blood. So what type of magnesium should we use, how much should we use, what are the symptoms, risk factors and what can we eat which is high in magnesium? Keep reading. 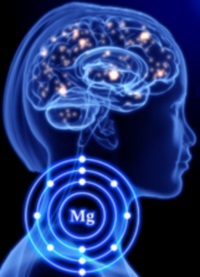 Dr Norman Shealy, a USA neurosurgeon, maintains that every known illness is associated in some way with magnesium deficiency – quite a sweeping statement, but as it is the most critical mineral required for the electrical stability of every single cell, it’s no surprise that a deficiency is could be responsible for more diseases than any other nutrient. We need magnesium like we need air and water to be honest, and Dr Shealy recommends around 1000mg/day for the healthy individual. Our diets today are calcium-rich and magnesium-poor, whereas it would be better to have a 1:1 ratio instead of a 15:1 ratio. Too much calcium is a huge problem causing asthma, anxiety, prolapse, migraine, ADHD, fibromyalgia and allergies –to name a few. Whenever there is too much calcium and too little magnesium there will be twitches, cramps, spasms and even convulsions. Magnesium also helps the body to detoxify, and chronic stress will further strip you of magnesium. Worried about your memory? Take more magnesium, it could be just the ticket – studies show magnesium is directly linked to memory function – and your learning ability improves as well. In fact it’s so effective for your brain there is some evidence it can prevent Alzheimer’s disease. Insomnia, apathy, migraine, cluster headaches, hyperactivity, even strokes and heart attacks. It’s a very critical mineral to take, especially when anxious as it relaxes your nerves, assists with digestion, relieves muscle tension and conducts healthy nerve responses. Up to 60% of your body’s magnesium is concentrated in your bones, with the remaining found in soft tissue and a little in the blood. Too little can also lead to chronic headaches. Clinical trials have found that MAGNESIUM CITRATE taken daily over long periods may prevent or even REVERSE osteoporosis. My 100% Pure Magnesium Citrate Powder (which you’ll find in my online store at here is a very pure and an excellent form of magnesium. Your blood pressure may rise if your magnesium levels are too low, and magnesium helps to regulate heart rhythm. It has even been shown that magnesium reduces risk of both heart attack and heart disease. Those who are elderly. As the body ages, the gastro-intestinal tract becomes less efficient at absorbing minerals, and many are on medications which prevent decent uptake of nutrients. There are different ways to take magnesium. You can use a transdermal application like Mag-nificence, a topical cream with shea butter – wonderfully absorbed into your skin. Some people find this works really well for them, others prefer my Pure Magnesium Citrate Powder. You can get oils and sprays but I find them horribly sticky and they tend to crystalise on the skin and feel all salty – I don’t enjoy that one bit. The oral and cream-based versions are best and research suggests that Magnesium Citrate is one of the best absorbed and most readily available forms of magnesium. You can also use my really special magnesium Luxury Bath Salts or the bath scrubs you will find in my online store. I believe when you have a deficiency which doesn’t seem to respond fast enough – do all three until you begin to feel better, and then drop one, and eventually stay on the Magnesium Citrate powder. When you take magnesium via creams or bath salts, you won’t overdose, however if you take anything orally, don’t overdo it. Having said that you want to take enough to make a difference. While the RDA is only 420mg, it is not really enough for the person who is deficient. Start on this dosage and if you are not getting a result, start going up slowly – Dr Shealy says around 1000mg is more like what we need. We’re each different, so just go slowly and don’t overdo anything. Get your Mag-nificence, Luxury Bath Salts and Magnesium Citrate Powder from my online store at here.